Mohanlal and Manju Warrier together sounds too good to miss but despite the casting and potentially interesting storyline, Sathyan Anthikad’s Ennum Eppozhum doesn’t quite meet up to expectations. The film tells the story of an erratic, middle-aged journalist and his attempts to interview a crusading local advocate but although the central storyline works well, diversions off the main path are rather less successful. However Mohanlal and Manju are excellent, the supporting cast is equally good and the down-to-earth ordinariness of the characters does work in the films favour. Mohanlal is Vineeth N. Pillai, a lazy middle-aged bachelor who is notable more for his lack of hygiene and questionable work ethic than his skill with journalistic interviews. His lack of energy is noted by Vanitharatnam magazine’s new editor in chief, Kalyani (Reenu Mathews) which doesn’t bode well for Vineeth’s continued employment. Kalyani is just returned from London with plenty of new ideas and has no time for a slob of a journalist who doesn’t pull his weight. Luckily for Vineeth, the former chief editor still has a fond spot for him as the son of her dear friend and ensures that he gets a second chance to prove his skills. Vineeth is sent to interview Deepa (Manju Warrier), an advocate who has been in the news for successfully campaigning to have potholes in the road fixed. Deepa is the antithesis of Vineeth. She is a single mother and not only manages to raise her daughter, work as a successful advocate and campaign for better roads, but she also teaches dance and performs too, as seen in this beautiful piece from the film. In his attempts to speak to Deepa, Vineeth is accompanied by bumbling photographer Maathan (Jacob Gregory). Maathan also lives with Vineeth and the interactions between the two form one half of the comedy track to the film. The other half is supplied by a shady developer (Renji Panicker) and his inept security guard, but this is one of those diversions that doesn’t add anything to the storyline while the comedy is slapstick and not particularly funny. The comedy with Jacob Gregory also fails to raise much of a laugh but there are a few moments that warrant his inclusion. Vineeth is further hampered by his car that continually runs out of petrol, some dodgy advice from a young employee and his own inertia regarding the assignment. However as he watches Deepa, her busy life starts to make an impression and Vineeth is drawn into assisting when Deepa and her daughter are involved in an accident. Deepa has her own problems to deal with, including her over-protective neighbour Kariachan (Innocent) and his wife Rosy (Usha S Karunagapally). They hover attentively around Deepa and her daughter Miya (Baby Adhvaitha) but seem to be more of a hindrance than a help. Deepa is also visited by a friend Farah (Lena Abhilash) who is another character who seems to run out of steam just when her story starts to get interesting. Farah talks about her marital problems which could potentially have been a major plot point, given that Deepa is also divorced from a rather obnoxious-sounding character. Instead the story goes nowhere and Farah’s inclusion seems fairly pointless except as a glimpse of ordinary middle class life in the suburbs. There are more odd and pointless diversions that peter out just when they start to get interesting. Deepa has dealings with a gangster who seems to help her when she wants to keep some cases out of the court system. This had potential since Vineeth spots Deepa paying money to some shady looking characters, but instead the story fades away without reaching any resolution. Vineeth also seems to be on the cusp of developing a romance with Kalyani, who in turn has an amazing about-face when it comes to Vineeth and his work. For no apparent reason, other than perhaps a shared like of Rod Stewart songs, Kalyani decides that Vineeth can take as long as he likes to finish the interview, and even doesn’t seem to mind when he admits he may not be able to interview Deepa at all! The romance which almost starts in one scene then vanishes completely without Vineeth even appearing to notice. The slow pace of the film suits the scenes of day-to-day living that form most of the story but it does mean that it takes a long time for Vineeth to approach Deepa. It takes even longer for the two to actually start speaking to each other, but when they do, they have a lovely and easy chemistry together. There is no real romance in the story, although the possibility is hinted at towards the end, but instead it is the characters and the details of their lives that are the focus of the story. Ennum Eppozhum is at its best when showcasing the lives of the two main characters, their strengths and weakness and their interactions with the world around them. Without all the added threads that go nowhere this could have been an interesting picture of two very different personalities, but the noise created by the sub-stories dilutes the effect. However, it’s always good to have a strong female lead character and Manju Warrier is adept at portraying such roles. Mohanlal does an excellent job with his rather unpleasant reporter and yet still makes appealing enough that we want him to succeed and keep his job. Not a great film, but one still worth watching for excellent performances from all the cast and the pleasure of watching Manju Warrier dancing. It just could have been so much more. 3 stars. I want to grab Koratala Siva and shake him till his teeth rattle, then kick him into the middle of next week. He has managed to get a top notch cast and the beginning of a good idea and turn it into something far less than the sum of its parts. 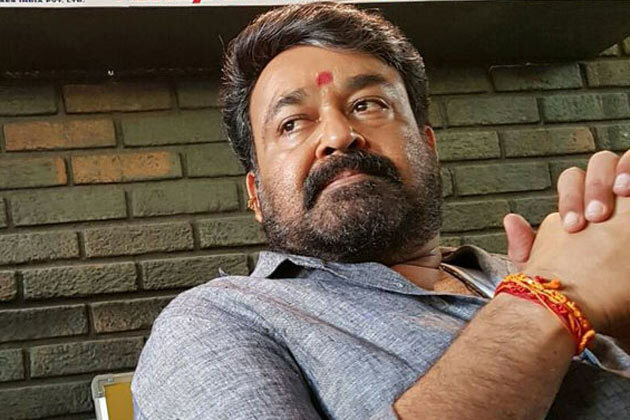 Sathyam (The Complete Actor Mohanlal) is the head of Janatha Garage, a leader, and is genuine in his desire to give the little people a fair go. Mohanlal has great conviction and gravitas when he speaks of what is right and fair, and he gives the impression of a man who seeks to take a balanced view but who will never take the easy way out. He gathers a small crew of like-minded men who also represent in shorthand the diversity of Hyderabad. 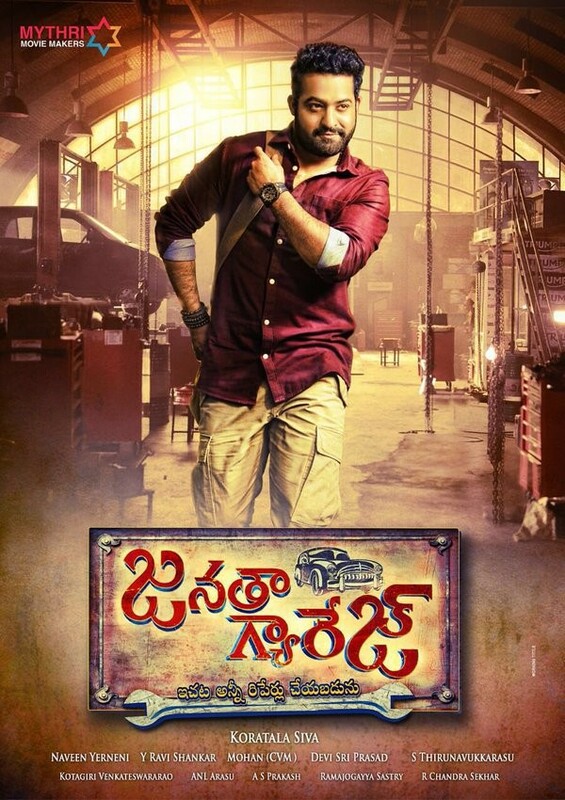 Janatha Garage repairs engines and problems. 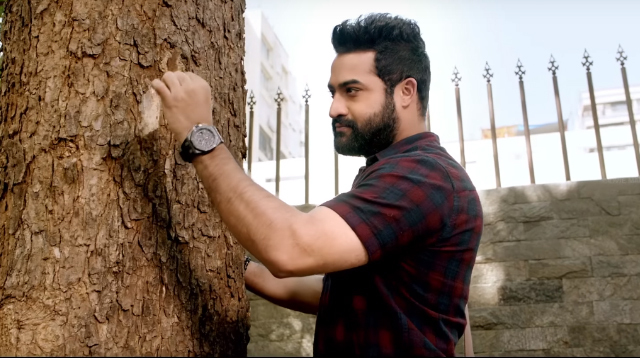 Anand (Young Tiger NTR) has an unusual hero entrance where he arrives to … plant a tree. Or actually, tell someone he’s busy and so can they please plant the tree. Anand’s environmentalism is very simple. Trees good, humans bad. He doesn’t seem to have a problem with wanton destruction as long as it is him dishing out the destruction. He is given an overblown fight intro where he beats some thugs up while claiming to be giving them a taste of Mother Nature’s temper. He tells people what to do and believes they will do it because he has told them so. Sathyam sees him as a good fit for Janatha Garage, and welcomes him into the fold. Some of the movie’s highlights are the scenes between NTR Jr and Mohanlal. Their characters have a connection that is unknown to either of them for quite some time, so that added a bit of interest for the audience. They both bring more to the table than that flimsy screenplay required. The actors portray a nice dynamic – warm, mutual respect, and a recognition of the gradual changing of the guard and what that means. But there are too many gaps and things that Anand in particular just accepts too easily. This is not a lack in Tarak’s acting – I felt he added as much complexity as he could. Both Anand and Sathyam are so sure they are right, and that their right is more right than anyone else’s idea of right. Anand in particular brooks no discussion and has no compassion for anyone who opposes him. It robs his character of any inner life, and makes them both rather joyless. And that lack of heart is the real problem with this film. For a story that should be so intimately tied to people and their daily struggles, once the story moves to Hyderabad Janatha Garage seems to take place in a lifeless bubble. The sound design makes it seem like they are on a stage with echoing dubbing and swelling string music every time Janatha Garage is invoked. In contrast, an early scene of Anand running through a slum area in Mumbai had a real sense of place and the vibrant, persistent signs of life in high density cities. Even in the impressively choreographed action scenes, Anand takes on all comers alone. He finally allows the other Garage guys in on the final fight but they are barely on camera. And he never even gets a mark on his linen shirts, let alone get his hair messed up. I wonder if his construction strength hair product was environmentally friendly? His apparent invulnerability also saps the drama of tension because you know how every fight will end before it starts. The support cast are pushed so far into the periphery that I was actually a bit sad to recognise so many capable actors. The Janatha Garage family includes Rahman as Sathyam’s murdered brother, Sithara as Anand’s aunty, Suresh as his uncle, and Devayani as Sathyam’s wife. Perennial favourite Ajay is likeable and sympathetic, Brahmaji doesn’t look angry for maybe 40 seconds of his total screentime, Saikumar is suave as police chief Chandrasekhar, and I liked Vennela Kishore’s fleeting appearance as an inappropriate office manager flirting with Samantha. I have just spent as much time on developing their characters as Koratala Siva did. The baddies were played by Sachin Khedekar and Ashish Vidyarthi who both exuded an urbane egotism in their pursuit of wealth. They both want to keep a distance from what is being done, but have no illusions about the outcome. Unni Mukundan plays Sathyam’s son Raghava who goes over to the dark side. Raghava is slimy and bit of a sook and I cared not one jot for his well-being. But I did wonder just how he turned out that way when everyone else even tenuously associated with Janatha Garage was lining up for sainthood. Samantha and Nithya Menon are capable, and both project warmth and liveliness which was sorely lacking in the rest of the film. But their relationships with each other and with Anand were never developed, and their storylines just fizzled out. Even Anand, apart from one tearful scene, seemed largely to forget that he had a girlfriend and a spare. And who on earth thought Kajal could deliver a skanky item? She’s very attractive, she gives it her all, but she has none of the sensuality or basic coordination required to dance her way in and out of trouble. And casting a Mumbai girl to perform a Telugu item called Pakka Local…Luckily Tarak decides he can’t see the excellent sets go to waste so he jumps in. I’m putting the flaws in Janatha Garage firmly on Koratala Siva’s account. He had a super cast, a decent budget, and a good idea and he threw most of it away with shoddy writing and empty clichés. 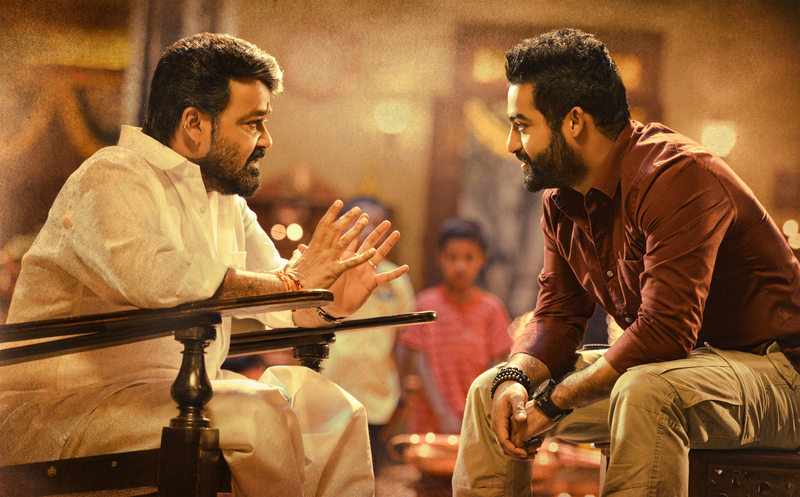 One for the Tarak or Mohanlal fans who will enjoy the star performances. There have been a number of good films released recently where the main protagonists have been children or juveniles, and Mythri is another one to add to the list. B.M Giriraj’s bilingual film follows a young Siddarama (Aditya) as he ends up in juvenile detention and makes it onto the TV show ‘Who wants to be a Millionaire’. There are shades of Slumdog Millionaire given that much of the film revolves around the TV show, but Mythri follows a rather different path. Here Siddarama is a big fan of Puneeth Rajkumar who hosts the show and it’s the plight of the young prisoners and their rehabilitation – or rather lack of rehabilitation that becomes the focus of the story. Siddarama (Aditya) is a smart kid but he makes some poor decisions and ends up in jail after throwing stones at a passing police officer. His mother is out of her depth and to get her young son out of jail she approaches Gudi Pratap (Ravi Kale), a womanising thug and aspiring politician who runs drug and child trafficking rings on the side. Although he does deliver and gets Siddarama released, Gudi demands reparation for his services and it’s obvious that Siddarama’s mother is going to get the worse end of the bargain. Once free, Siddarama is lucky enough to meet his idol, film star Puneeth Rajkumar (as himself) when he comes to their area to shoot a scene for his latest movie. Siddarama makes an impression on Puneeth with his scrapbook about the actor and his excellent general knowledge but fails to make the final cut of the scene when he rushes away before the end of the shoot. It isn’t until much later that the reason for Siddarama’s quick exit is revealed and the next time we see Siddarama he’s incarcerated in a juvenile detention centre. Siddarama is one of the younger and more vulnerable boys, so it’s no surprise to find he is being victimised by a group of older youths who are unimpressed when he dobs them in to the warder Raviprakash (Atul Kulkarni). Despite his small stature and obvious dislike of violence, Siddarama fights back when the bullies gang up against him, and in doing so he earns the admiration of Jhonson (Jagadish), another young thief in the remand home. Jhonson is a serial offender, and the warders keep him chained up at all times to ensure he can’t steal anything further – unsurprisingly not a successful tactic! However, Raviprakash has firm views on how the young offenders should be treated and believes that strict discipline is the only way to teach the criminals how to behave. The harsh treatment of the boys and the poor condition of the detention centre are shocking and it’s understandable that most of the inmates either reoffend or become drug addicts after their release. Even the most basic of care is lacking and the warder meets violence with more brutality and an almost casual disregard for the boys’ welfare. Atul Kulkarni is excellent here in the role of the strict and uncompromising warden. His interactions with the boys are frighteningly realistic and his reaction to a visit from the movie star is a perfect blend of admiration followed by condescension when Puneeth questions his regime. The rationale for his stance is one that seems logical – he came from a similar poverty-stricken background and didn’t turn to crime, so the youngsters in his care have no real excuse. This is one of the strengths of the film that such social clichés are shown to be inaccurate and too simplistic a view of more complex issues. Additionally the point is clearly made that education rather than punishment is the solution most likely to turn the young offenders’ lives around. The film moves on to the TV show Karunada Kotyadipathi when Jhonson discovers Siddarama can answer the test questions for a children’s version of the show. With a lot of sneaking around behind the warden’s back, Jhonson manages to enter Siddarama as a potential candidate but it all hangs in the balance when the producers request a guardian for Siddarama. Raviprakash decides to let Siddarama go ahead – perhaps to demonstrate to Puneeth that his methods do work but also because he is impressed by Siddarama’s knowledge and is even a little proud that one of ‘his boys’ is clever enough to compete on the show. Again the decisions seem plausible despite the theatricality of Puneeth’s involvement, helped by Adithya’s portrayal of a young boy almost overwhelmed by the whole experience. There is an odd twist to the tale when Mahadev Godke (Mohanlal) appears and tries to stop Siddarama from competing. This part of the film is inconsistent with the realism of the earlier scenes and the persona of Mahadev Godke is a little too contrived to fit easily into the narrative. However Mohanlal is good, his story helps to fill in the gaps and it also allows B.M. Giriraj to use a rather literal interpretation of the lifelines used by the show. Mythri succeeds due to the excellent performances from the main leads and a well-developed storyline. Aditya is great as the young Siddarama, appropriately whiney and sorry for himself as expected for a kid his age, but also suitably resigned to his fate and more adaptable than even he realises. It’s a very good performance from the young actor and he holds his own well against the likes of Atul Kulkarni, Mohanlal and Puneeth Rajkumar. Jagadish too is good as the recalcitrant thief and the other kids in the remand home all play their parts well. Puneeth Rajkumar has a relatively easy time of it since he just has to be himself, and perhaps it’s inevitable that he comes across as basically a nice guy – considerate and thoughtful. However at no point does he seem self-indulgent despite being shown as altruistic while his philanthropy and basic decency seem genuine. The only part which does seem somewhat forced is the movie within a movie where Puneeth is shown filming an over the top action sequence that ends with a rather cheesy message. It’s rather B-grade compared to the rest of the film, but maybe that’s the point. Ilaiyaraaja provides the music and although there are only a few songs they are used effectively and suit the overall feel of the film. My favourite is Chandranenu Chenda, but the energy and exuberance in the title song is infectious and always makes me smile. Overall Mythri is an intelligent and entertaining film with a social message that comes across clearly without becoming depressing or preachy. Despite the rather dire situation the kids in the remand home are facing, they still enjoy themselves and completely get behind Siddarama and his attempt to win the competition on TV. It’s a more upbeat film than the opening sequences would suggest and the combination of a well written story with polished performances makes Mythri well worth a watch. 4 stars.